Keep your packing fork handy because you’re going to NEED it! 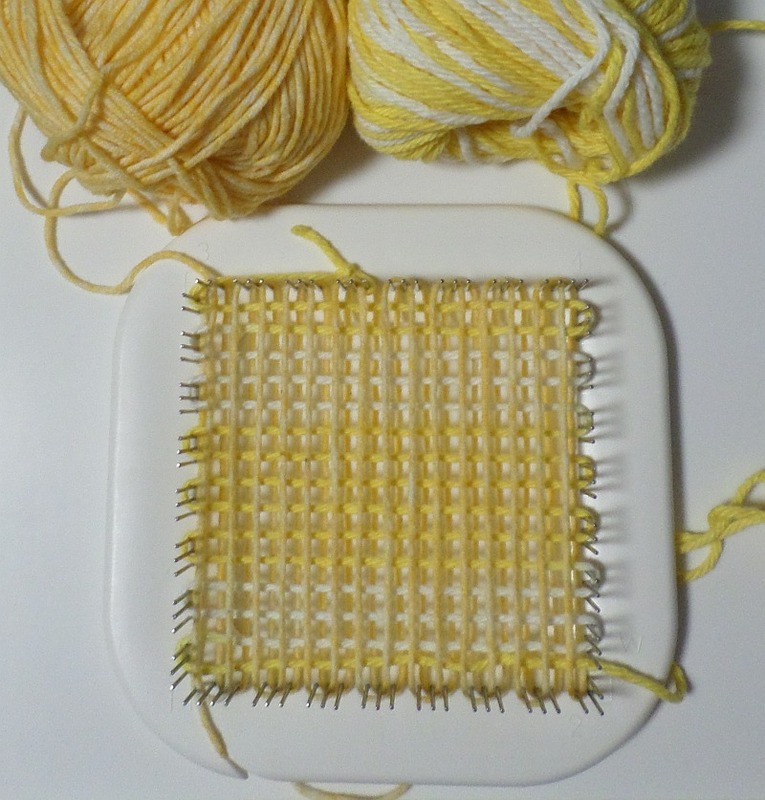 I used hand-dyed Sugar ‘n Cream 100% cotton yarn for the first three warping layers, and should have used 100% cotton in a lightweight yarn, but my color choices were limited; I didn’t want to use white. Instead I used DK weight Cascade Sunseeker Shade “Boy Blue” (Acrylic/cotton blend—apparently no longer available). 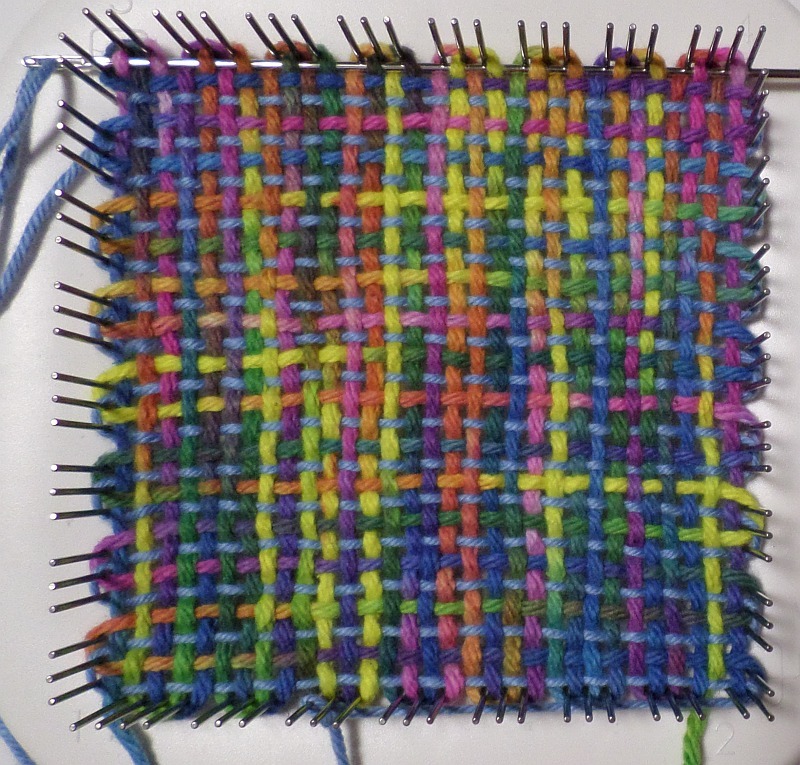 I tied the yarn for L4 onto the 1-2 edge of the loom, wrapped 5 times, cut, and began weaving. I quickly noticed how absolutely necessary it is to pack each L2 row as snugly as possible against the preceding L4 row. It became increasingly difficult to get the needle to exit the row in its proper place. Keeping the needle on a straight horizontal was a painful challenge! 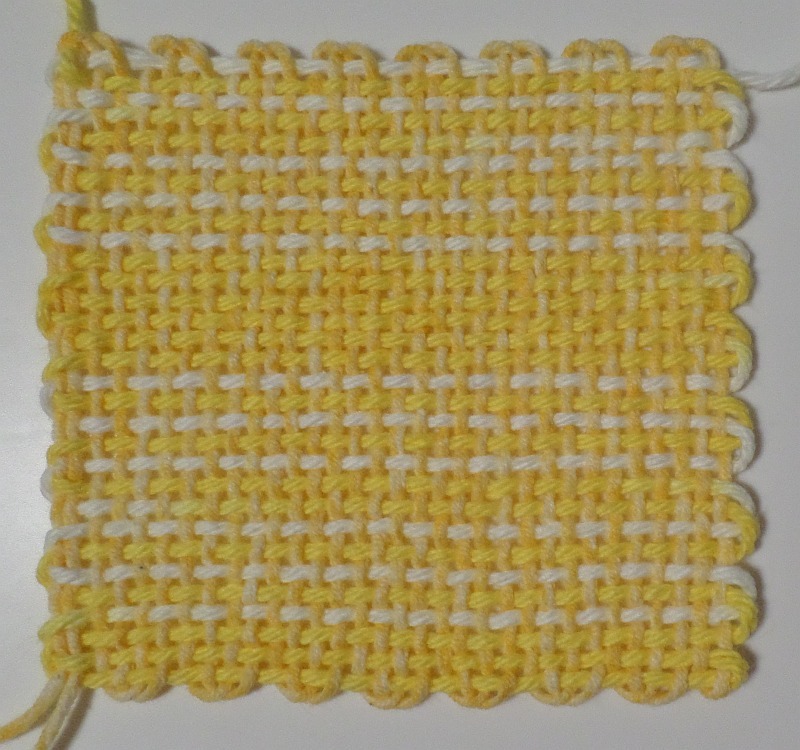 It was really stressful on my hands to finish this square. It’s a pretty square, but not worth the effort, in my opinion. 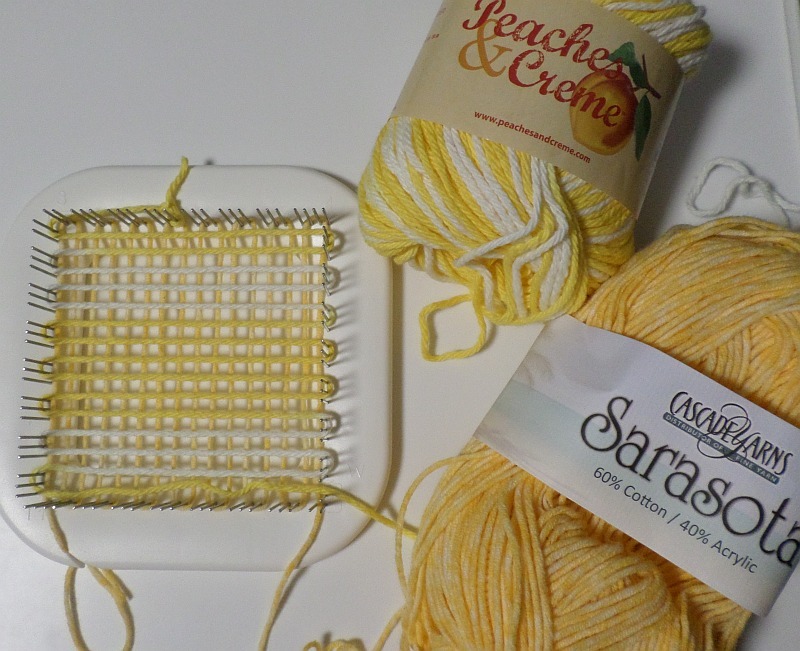 I used Cascade Yarns Sarasota (cotton blend) “Saffron” for L1 and L3, Peaches & Cream (worsted weight 100% cotton) color # 02165 for L2 and L4. It’s a bit tricky (but not difficult) warping in the 1&3/2&4 set-up. 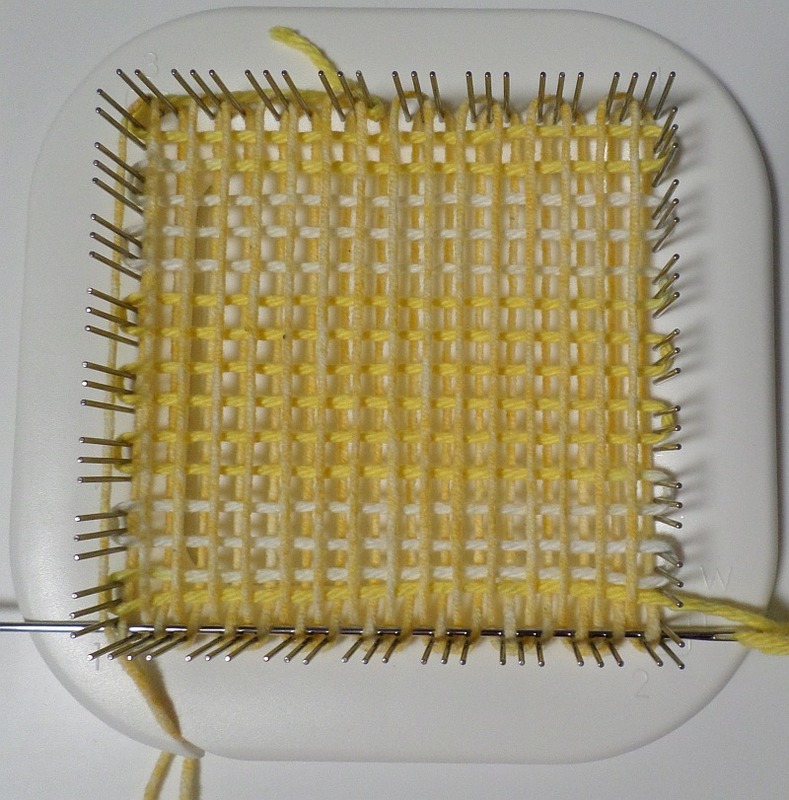 Pick up first yarn again at Cr2, wrap ONE PIN ONLY and warp L3 backward from Cr2 up to Cr3. 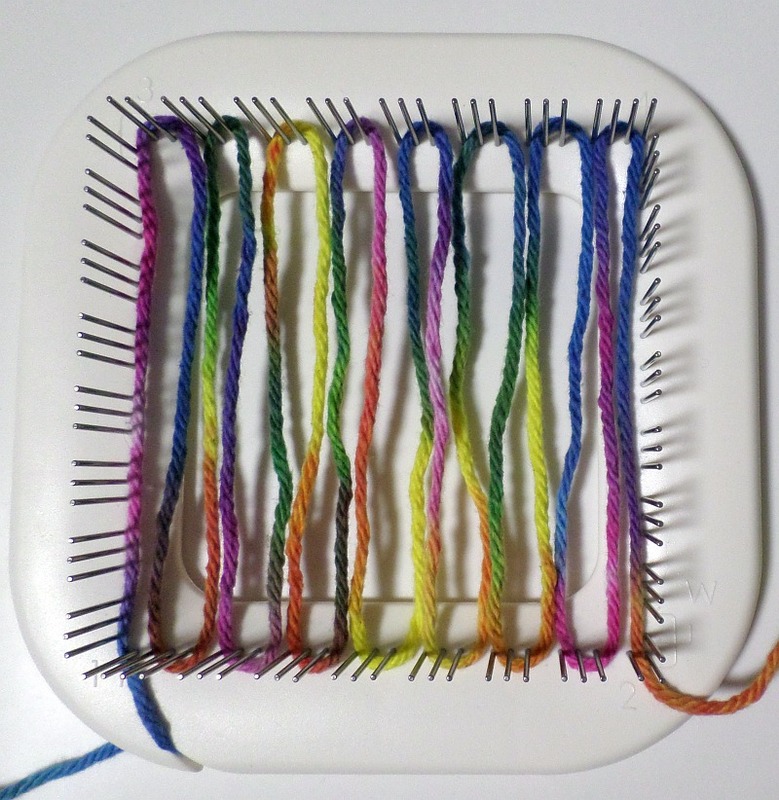 Cut yarn and attach to loom (or leave hanging) in your preferred method. 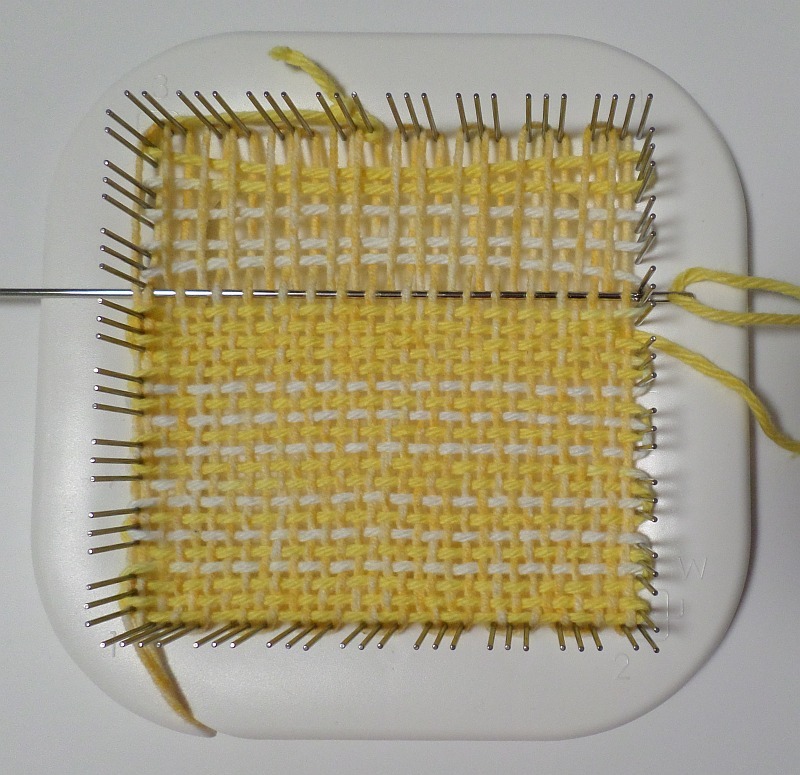 This demo will show that I bring the L3 tail down along the outside of the 1-3 pins into the notch, and will work in that end as I weave. 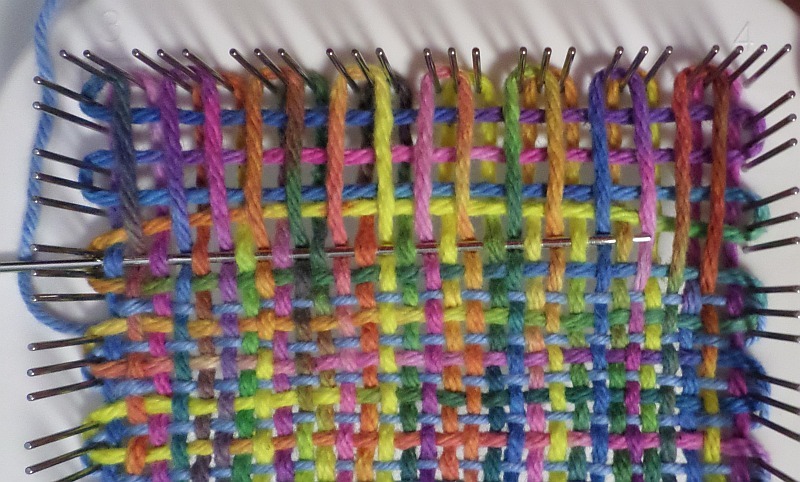 Here’s a close-up of the paths the yarns take at Cr2. 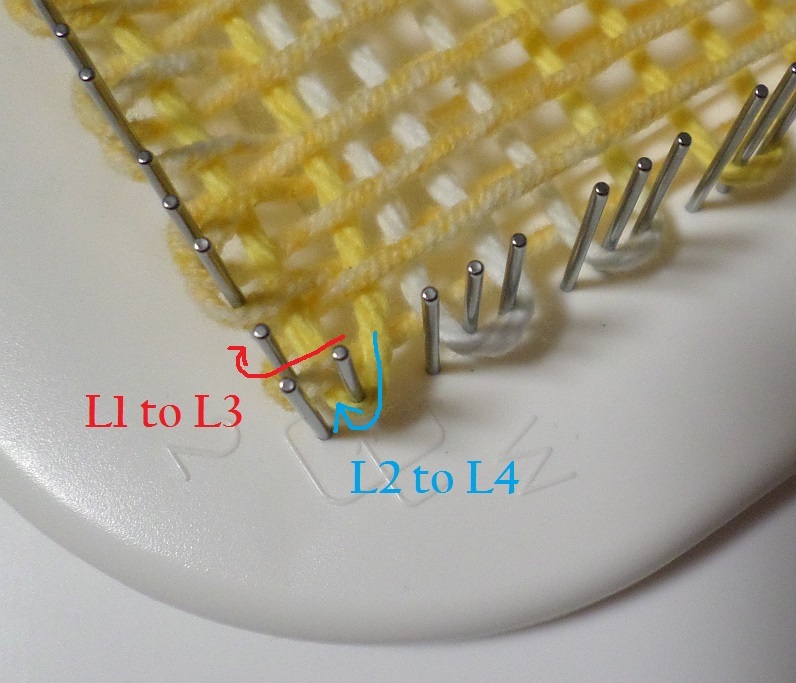 L1 to L3 wraps one pin; L2 to L4 wraps one pin. 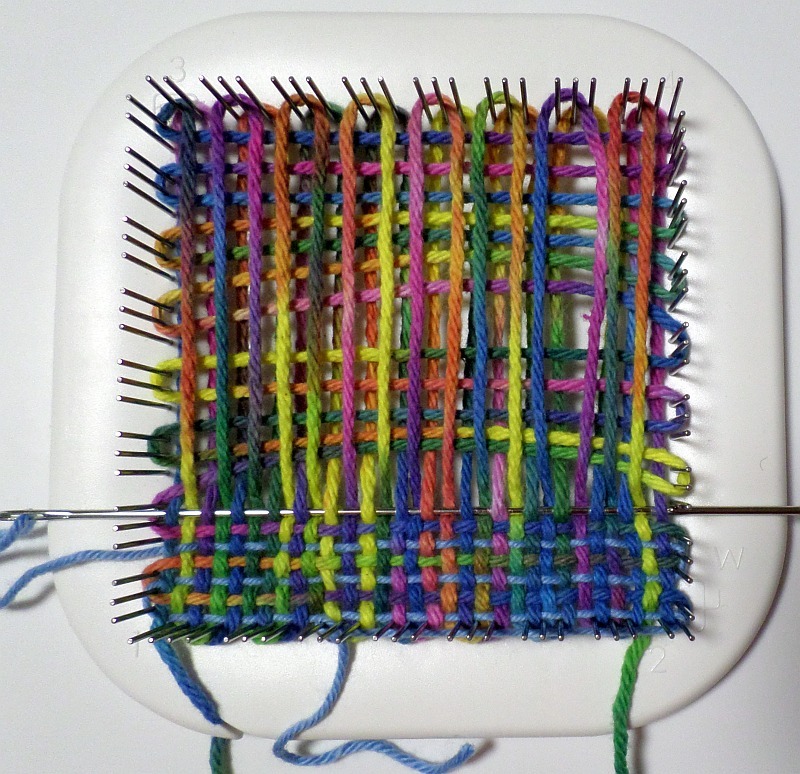 Take the second yarn at Cr2, wrap five times around the pins, cut, begin weaving. See above photo for the path the yarn takes to begin L4. 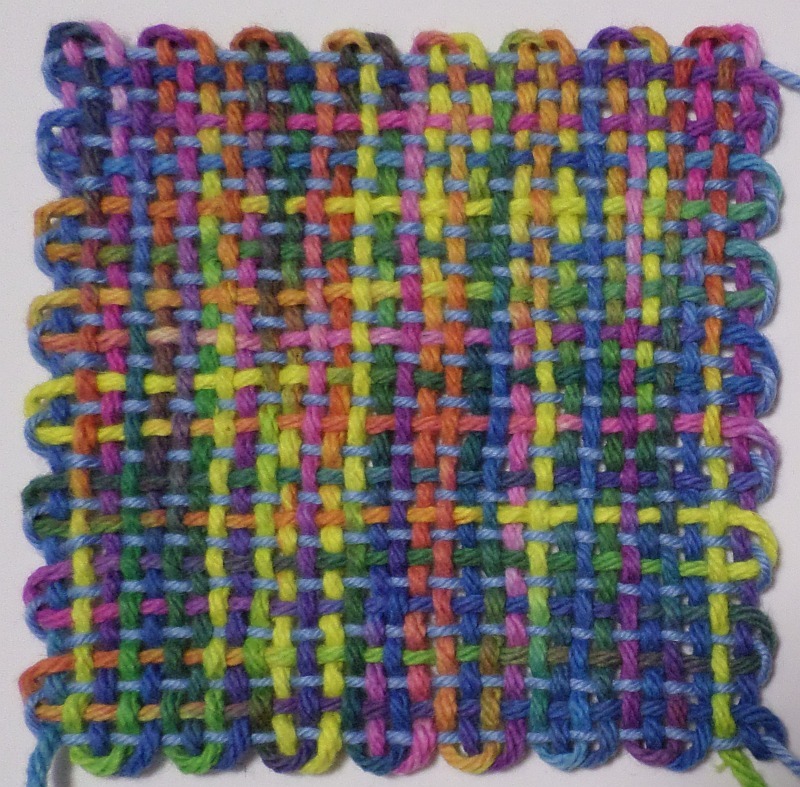 Because Sarasota is a pleasantly stretchy yarn, this square was a dream compared to the previous semi-nightmare. 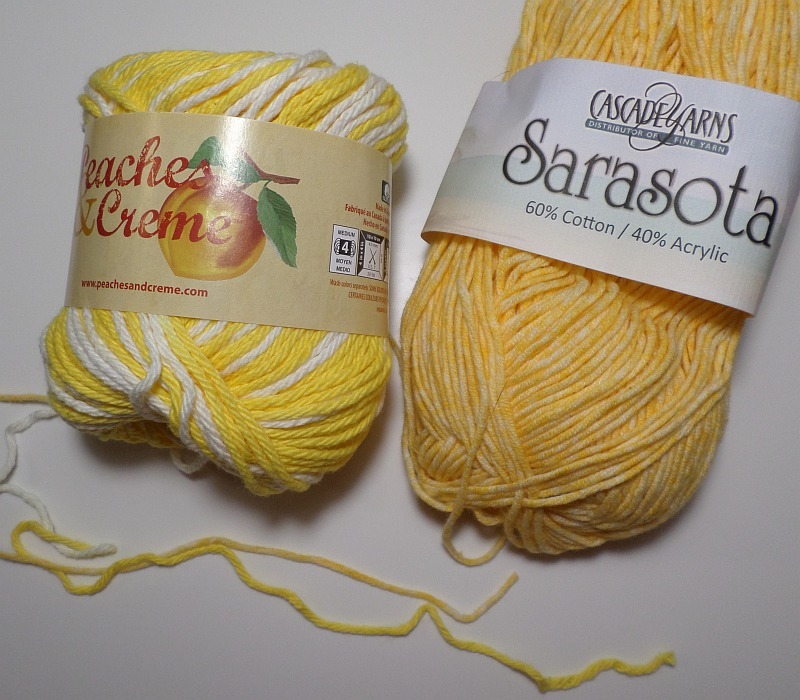 I highly recommend this combination of yarns. 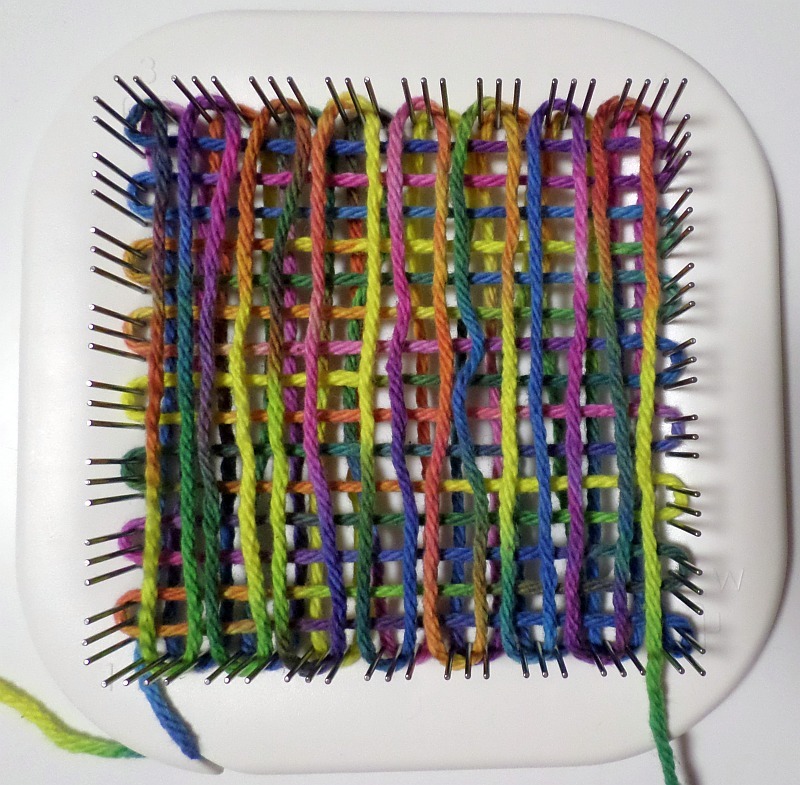 I could do one more demo (or at least a trial) of thin and thick 100% cotton yarn. I suspect the Demo #2 method will work the best. Or . . . I’ll leave that adventure to you! 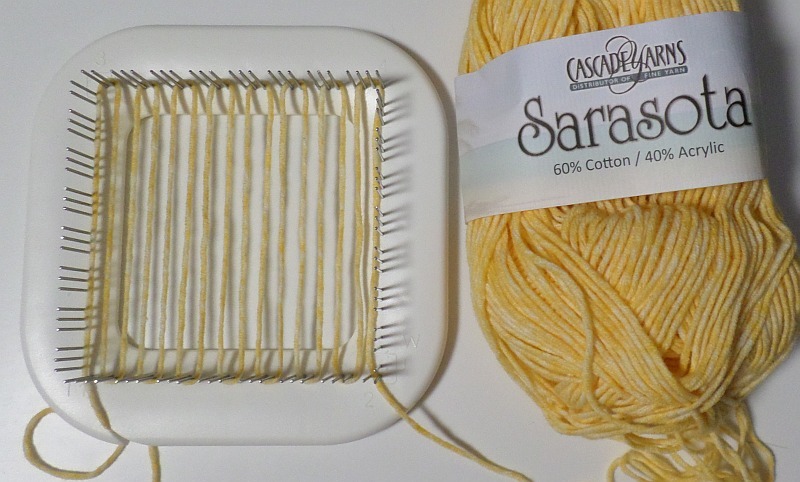 Do you have a video on hand dying the cotton yarn? I have never done it before and really liked the look of what you have. I don’t have much experience with cotton dyeing. 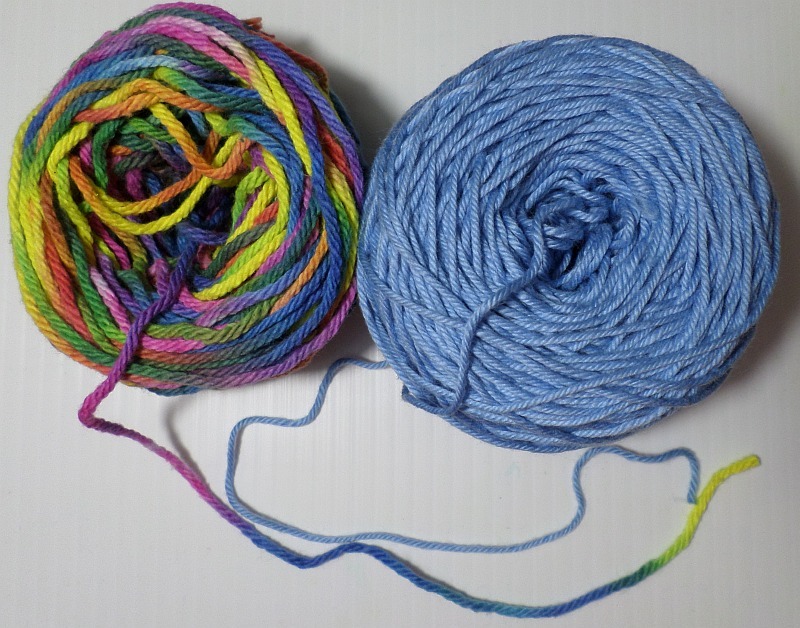 I dyed the yarn in the first sample over a year ago under the supervision of a friend who knows ALL. It’s not difficult to do, but you have to know the steps. 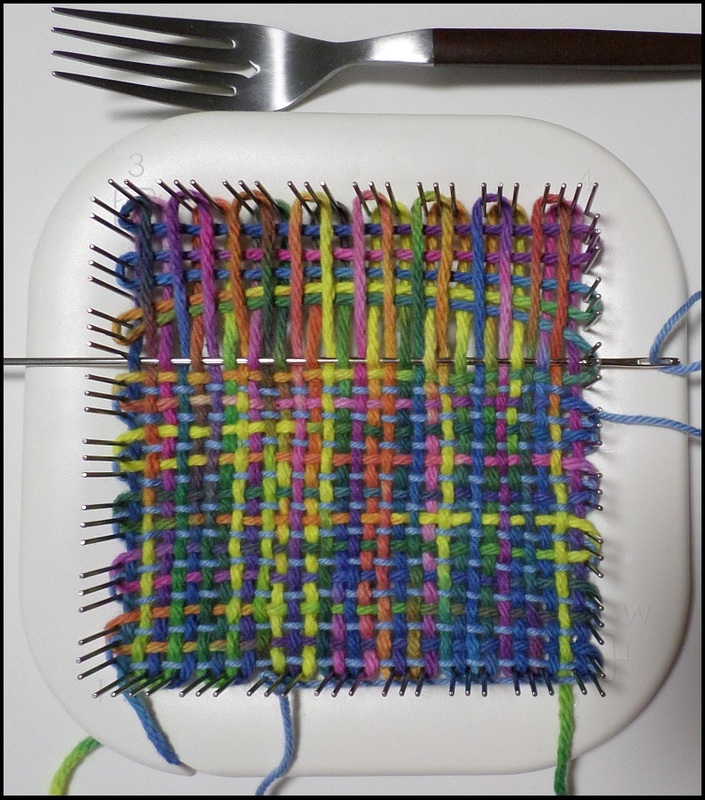 You prepare the yarn (tied it into hanks), soak the yarn in a (potash?) solution for a while (about 30 minutes? )–I don’t know the formula of the solution and I think that’s the main trick. My friend mixed up all the dyes too. Then you apply the dye (protect your surfaces), wrap it up in plastic and let it sit overnight. Then you rinse it and rinse it and rinse it till you think you’ve exhausted your city’s water supply for the year (that was really tough because I hate wasting water!). Not difficult, but it helps to know what you’re doing–and to have a friend who has all the equipment.